That was on Dec 27. Once again, I spoke too soon. There were still four more days left in 2015. “It ain’t over till it’s over,” said US baseball legend Yogi Berra, who died recently in September. Who could’ve guessed that in those remaining four days, an even bigger scandal would rock the nation right down to its flip-flops, surpassing the outrage over 1 Sengkang Mall? Coming in just under the wire, the most explosive scandal of 2015 turned out not to be the renaming of a shopping centre — but the naming of a junior college. Ground zero was Acting Minister for Education Ng Chee Meng announcing on Tuesday that a new junior college will be named Eunoia Junior College. He said that the name “Eunoia” has Greek origins and means “beautiful thinking” and “goodwill towards others”. Future historians will look back on this as the announcement that launched a thousand puns — “you know, ya”, “pneumonia”, “Yoshinoya”, “Little Nonya”, et al. Even The Straits Times said Eunoia is a name that will surely annoy ya and sounds like an awkward cross between “urine” and “ammonia”. Cramming all the vowels in the alphabet into a name without repetition is not a selling point. Yes, by the looks of it (and the nicknames alone), every Eunoian would probably need considerable courage to go to a school called Eunoia. And it’s not even in Eunos. Before moving to its permanent home at the junction of Sin Ming Avenue and Marymount Road at the end of 2019, Eunoia JC will temporarily be at Mount Sinai. Wait. Mount Sinai? Why are people complaining about Eunoia being a foreign name when there’s a place in Singapore called Mount Sinai? Isn’t that where Charlton Heston received the 10 Commandments? 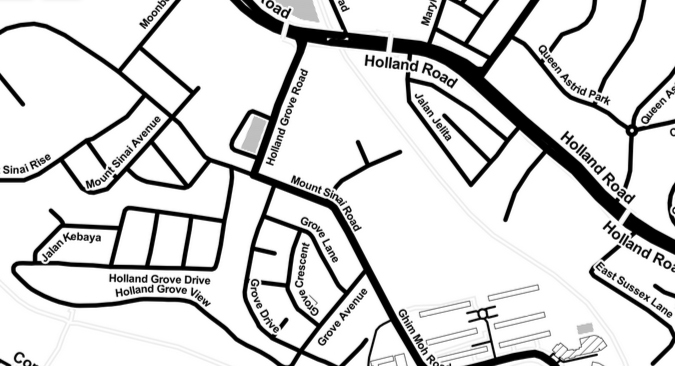 Thou shalt not give names to places in Singapore that may confuse taxi drivers. 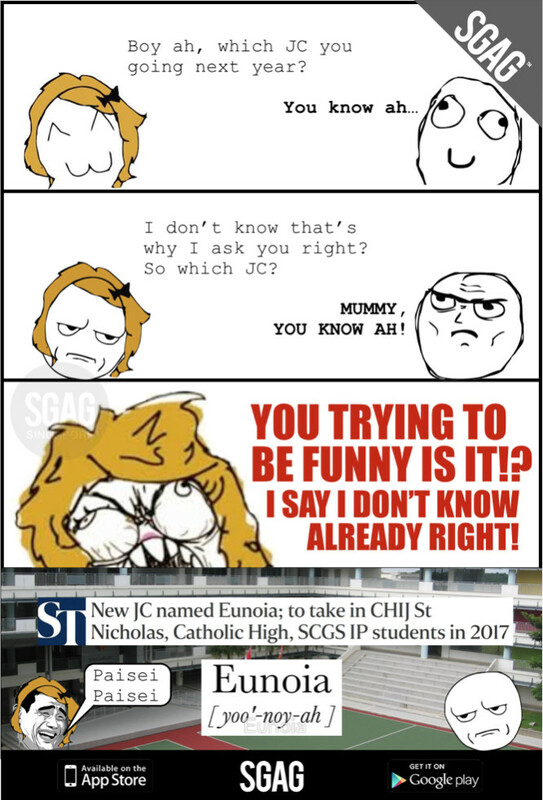 Which is why 1 Sengkang Mall is a better name than Eunoia JC. Remember when people complained that the name 1 Sengkang Mall was uncreative? Now they complain Eunoia is too creative. That’s what I call ironoia. 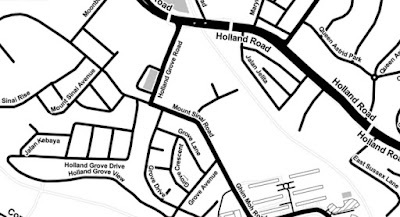 Also, 1 Sengkang Mall is a very local name and there’s no debate over its pronunciation. MOE says Eunoia is pronounced “yoo-noh-iea”. One language expert says it’s “eh-yu-no-ya”. Another claims it’s “ev-nee-ah”. 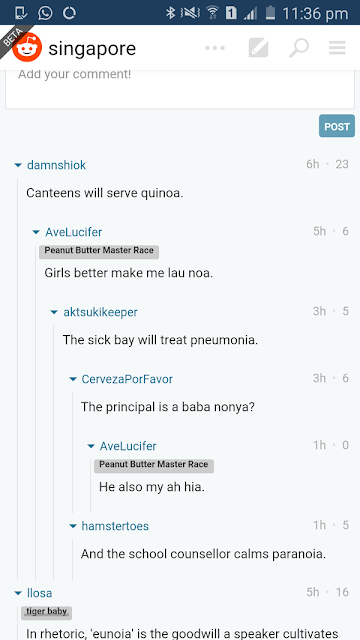 Since when did Singaporeans care so much about correct pronunciation? This is a country where we still mispronounce “algae” as “el-gay”. I’m surprised no one created an online petition to stop algae from performing in the Mediacorp countdown show. 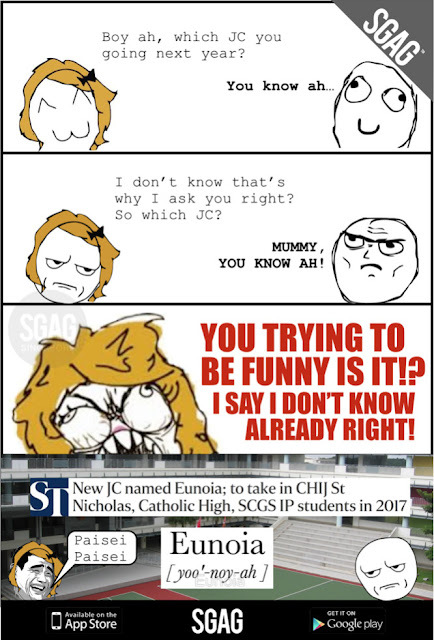 But you know what really makes the naming of Eunoia JC a bigger scandal than 1 Sengkang Mall? The name 1 Sengkang Mall was chosen after Compass Point held a renaming contest in October and a woman won $1,000 for it. MOE said the name Eunoia Junior College was chosen to demonstrate “not only the college’s commitment to nurture students with outstanding academic abilities, but its belief in the importance of building character and wisdom in tandem with intellectual pursuits”. I believe the people at MOE are paid a whole lot more than $1,000. Oh, before I forget, since this is my first column of 2016, let me take this opportunity to wish everyone a happy eu noia.